iRULU eXpro 4 Max Tablet (X4 Max) features a brilliant 10.1" 1080p Full HD display (1200*1920). Enjoy widescreen movies, videos, and games with wide viewing angles, less glare, and more brightness because of a stunning IPS LCD display screen. iRULU eXpro 4 Max Tablet (X4 Max) comes with the most internal storage at 32GB, great for offline video watching. Expand your storage up to 128GB by using a microSD card. You can keep photos, movies, music without worrying about storage. iRULU eXpro 4 Max Tablet (X4 Max) features a 2.0MP rear-facing camera for taking photos or shooting 720p video. The 2.0MP front camera is perfect for Skype calls with friends and family. With latest Android 7.1 system, supports you to download any kinds of APPs. Personalize and enrich your tablet. Keep entertained with your favorite APPs. 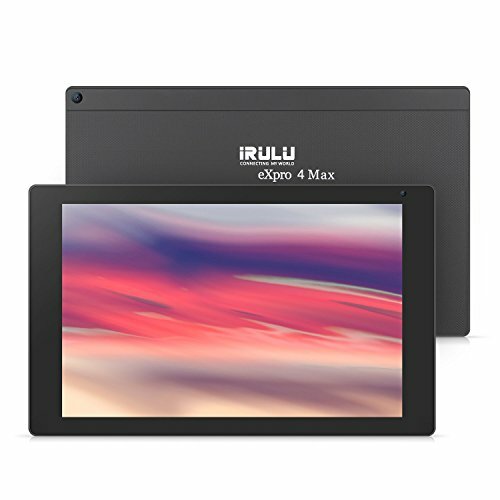 iRULU eXpro 4 Max Tablet (X4 Max) supports office application like Word, Excel, Powerpoint, PDF, etc. Handle with your work wherever you are. Set the work plan and it could alerts you. Such a intimate work partner you should not miss it. This tablet is preset with several Inputs. It supports smart handwriting and full keyboard which is convenience for fast typing. You could easily change this tablet from horizontal screen into vertical screen. Read in your most comfortable way.